You may have heard of it. Possibly seen the letters on your camera or smart phone screen: HDR. What does that mean? What does it do? Why should you care? Glad you asked. What follows is a simplified, lay explanation of HDR but it should suffice for our purposes. I’m also including some photos so you can see for yourself. HDR stands for High Dynamic Range. It can be useful, under certain circumstances, to improve the quality of your photography. I’ll tell you what it does, and more, but first you need to understand the concept of Dynamic Range. Easy, peasy… Simply put, Dynamic Range is the difference in brightness between the darkest point and brightest point in a scene. By point I mean place, area or spot. Pick your term. This range of dark to light may be called contrast, brightness ratio or dynamic range. Due to the limits of current digital sensor technology a scene with a lot of contrast may be beyond the ability of your camera to effectively record. Think of being in a forest with deep shadows while at the same time bright patches of leaves and forest floor where the sun isn’t blocked. Have you taken photos in such circumstances only to get disappointing results where some things came out too dark and others too bright? Bingo. HDR photography can, in many cases, compensate for the shortcomings of today’s digital sensors thereby overcoming the limitations of a camera’s technology. 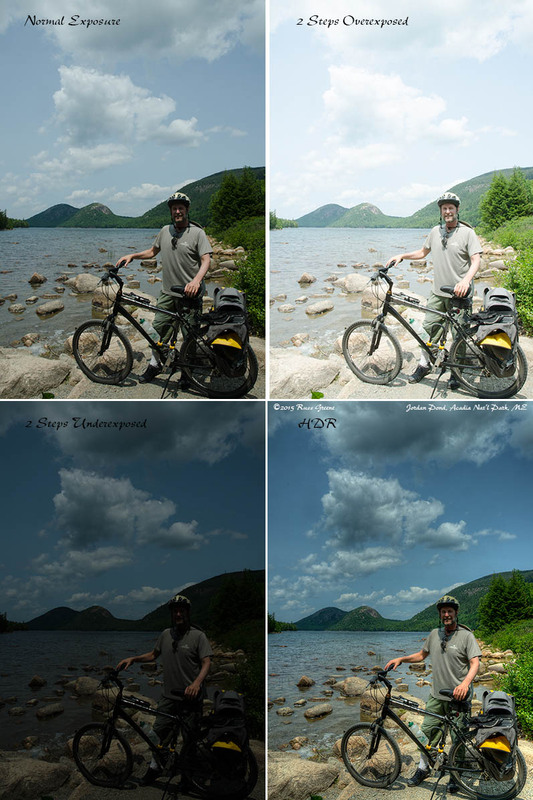 Let’s look at the four representations of me standing with my bicycle along the shore of Jordan Pond in Acadia National Park. (Click the image above to enlarge it into a new browser window.) At the top left is a shot I’ve labeled Normal Exposure. This photo was exposed allowing the light meter built into my camera to calculate the exposure. Most cameras set to one of the various automatic exposure modes would produce roughly the same results. It’s an OK photo, but just OK. It could be better. How? Let’s talk about that. First, look at my face. It’s a little bit dark in the areas of shadow. Look at the pannier on my bicycle. It’s dark too and it’s very difficult to see any detail there. The folds of the material are lost in darkness. You might also say that the sky is a little bit weak with faded blues and flat looking clouds. Now let’s look at the image marked 2 Steps Overexposed immediately to the right. For this image I set my camera to overexpose two steps (you can also say two f-stops). That photo feels “washed out”. Look at the clouds. Compare them to the Normal Exposure. They’re too bright and the delicate detail in the clouds is largely lost. Blechhh. However, look at my face and notice how the shadows have “opened up”. They are lighter and my face is more easily seen. Now look at the pannier and all the detail that you can see that was hidden in the darkness of the Normal Exposure. The normal exposure was too dark to show the detail that is captured in the darker areas of the overexposed frame. We are going to use HDR to lighten my face. We are also going to lighten the pannier and preserve its detail. “But wait, there’s more…”. We will also preserve, even enhance the detail in the clouds and add richness to the blue sky . Now let’s look at the photo in the lower left marked 2 Steps Under. This image was underexposed two steps. For the most part it’s really much too dark and on its own it would not be considered either a good or usable photograph, but it’s just what we are looking for. Why? Look at the clouds and all the detail that has been retained compared to the normal or overexposed images. The sky is bluer too. What if we could take the best from each image and combine them into one final photograph that is better than any of the other three alone? Now you understand the fundamental idea behind HDR. Just like that! You’re a genius. LOL. The image at the bottom right marked HDR was created from combining the other three shots using special HDR software called PhotoMatix Pro. There is other software that does this too, including some freeware (last time I checked). Some cameras have HDR built in and can do it automatically if so set. Even my iPhone can do it. That said, not all HDR is created equal. My iPhone doesn’t do a very good job of it. My Nikon may be somewhat better. Both of those work by combining two photos into one. I generally shoot at least three when I plan to create HDR images on my computer. PhotoMatix Pro has a wealth of options and flexibility not available on either my iPhone or Nikon. The purpose of this article is to be but an introduction to the concept of HDR; to explain what it is. What you do with that knowledge is up to you. Perhaps you’ll be satisfied just understanding what HDR is used for. Maybe you’ll want to try it for yourself. Perhaps you’ll go forward to learn a great deal more about it and regularly incorporate it into your photography as do I.
OK, so now that I’ve gone all blah, blah, blah into your ear about HDR let’s take a final look at what I’ve done with it in the sample HDR photo included with this article. We’ll compare the normal shot, the shot most cameras would produce, to the HDR image. The clouds are more detailed in the HDR frame than in the normally exposed image. The sky is a bit bluer. The mountains are similar. My face can be seen better in the HDR shot and look at all the detail in the shadows of the pannier and my pants. You’ll find other differences too if you make careful comparisons, but the basic idea in this example was to produce a better image more akin to what your eye-brain would see were you actually at Jordan Pond with me that day. Has this article been useful to you or enjoyable to read? You can say “thanks” by bookmarking my Amazon.com link and using in whenever you shop there. Thanks.